A bag of coffee should answer the 3 W's: Who, what, and when? Who produced this coffee? The land owner and the mill that had a hand in creating this product should be identified (when known). There must be as much information as is needed to begin to build a relevant understanding of the production chain in growing/picking/milling a coffee. Who is the starting point of a long chain of questions to ask about what makes a coffee unique. What makes this coffee special? Elevation, processing at the farm/wet mill/dry mill, regional location, and special packaging of the unroasted coffee for transport. Things that can impart or change/preserve the flavor of a coffee add to the knowledge base a consumer builds over time of what they prefer while trying different coffees. Do I prefer bourbon or caturra more? Am I more interested in higher elevation coffees? The list goes on but how can you build those preferences without knowledge of them existing as a contributing factor to a coffee. When was this coffee harvested/roasted? Knowing the crop year is a nice item but it's often too rare an addition. Knowing the roast date is one of the most basic and fundamental tenets of good coffee. The nicest production with the best terroir roasted to perfection will be wasted by staling. A clearly labeled and recent roast date is the first real indicator you will get your money's worth or have a chance at a better coffee experience. "If coffee is truly to learn something from the wine model, it is that brand identity for farms (even in a blend) adds value for both the producers and their consumers." Identity is a powerful thing. Prominently displaying the producer information gives the farm a brand with a sense of the components that go into creating the flavors of that coffee. This is so valuable that even larger roasters borrow this identity and sense of place by naming some of their large mill and co-op blends with farm style or estate-like sounding (although slightly misleading) names. With single estate coffees, this process of identifying the producer and micro lot name is becoming more main stream every year. For espresso, it is clearly not the case as we are sliding backwards locally. (A recent cafe crawl of what are supposed to be top shops in town found that almost all not serving barismo were serving a blend with unknown -to the barista- components. Seeing great gear with talented barista precisely executing mediocre dark roasted blends was a let down. That disappointment inspired this post.) The long known secret with roasters is that you can mix together lesser quality components, roast it darker, and charge a better markup if the mystery inside is not revealed (as long as it says espresso on the bag). Identifying the constantly changing mix of coffees in a blend and having cafes/consumers look up the components could cause problems by revealing the secrets of the blend. Those secrets may not be glorious and the previous perception of a good deal could easily turn around with a little more delving into the ingredients. High end micro roasters working with estates are more likely to abandon the faceless blends identified with mass produced roasting outfits and more have been opting for complete transparency. If coffee is truly to learn something from the wine model, it is that brand identity for farms (even in a blend) adds value for both the producers and their consumers. The basic question: Is the roaster proud enough of the product to show what's in it? Transparency is that affirmation. 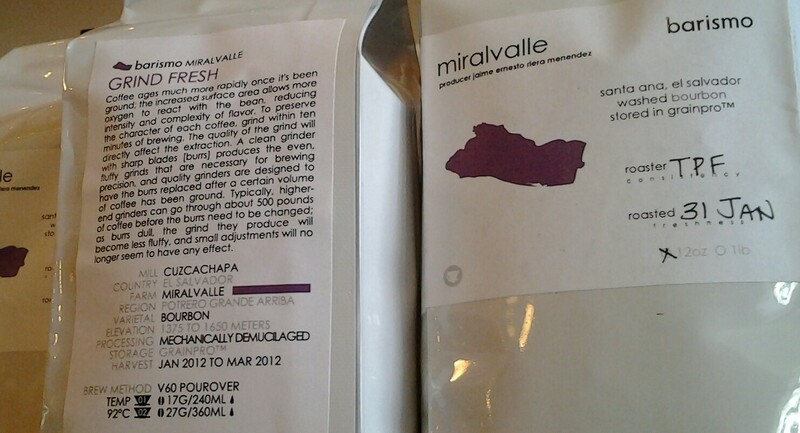 Labeling with confidence speaks to knowledge of the coffee and what makes it special. That, in turn, can infer there is knowledge of how to continue to make it better.